Perfect Foundation for Any Big Block Chevy Build! Ideal for street, ET bracket racing, and marine applications, World Products applied almost 15 years of Merlin knowledge to develop these blocks, offered bare or race-prepped. The race version features a thoroughly-washed block, plate-honed cylinders to the bore size, and installed cam bearings and freeze plugs. Merlin III blocks have reinforced bulkheads and main webs, thicker decks, 100% compatibility with Mark IV components, and indexed lifter bores for optimum reliabilty. Their quality is superior to OE parts, especially because each block is CNC-machined to QS-9000 specs using only two fixturing operations (thus avoiding tolerance stacking common to factory blocks from assembly lines). Cylinder bore sizes are standard, with bores semi-finished to allow final honing to suit your specific piston and ring package. Race prepped blocks are finished honed to an exact 4.500'' bore. Made In The USA! Merlin III Mark IV-style big block is a two-piece rear main seal and compatible with all original GM Mark IV pieces and components including fuel pump, starter, oil filter, and cylinder heads. Merlin III Gen VI-style big block features a one-piece rear main seal and a Gen VI-style oil pan rail and front cover bolt pattern. The block can utilize either the OE type roller lifters or +.300'' tall tie bar lifters. It also features a Mark IV style fuel pump boss and oil filter pad. 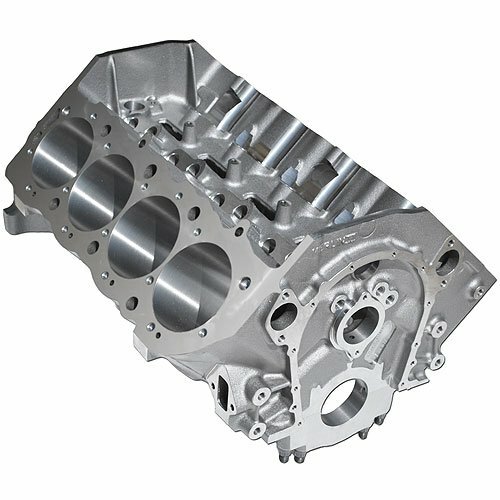 The water jacket and surface will accommodate either Mark IV or Gen V-VI style cylinder heads, making this block extremely versatile.